The Executive Committee of the National Economic Council (ECNEC) today approved the ‘Improvement of Livelihood of Marginal Communities Programme’ at an estimated cost of Taka 826.12 crore. The programme is aimed at providing housing to some 20,000 ultra-poor families in city corporations and municipal areas side by side with reducing urban poverty. 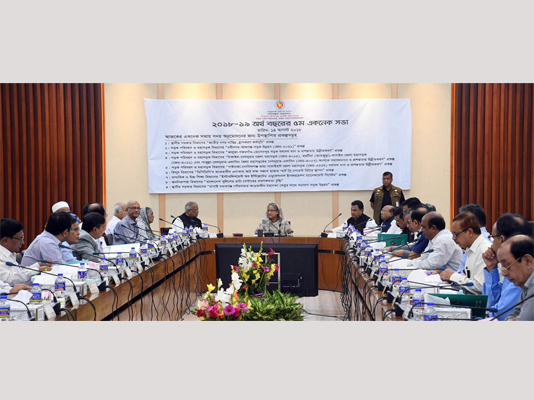 The approval came at the 5th ECNEC meeting of the current fiscal year held in the NEC Conference Room in the capital’s Sher-e-Bangla Nagar area with ECNEC Chairperson and Prime Minister Sheikh Hasina in the chair. Briefing the reporters after the meeting, Planning Minister AHM Mustafa Kamal said a total of 9 projects were approved today involving an overall estimated cost of Taka 3,088.35 crore. “Of the total project cost, Taka 2,339.88 crore will come from the GoB portion, Taka 50.54 crore from the organization’s own fund while the rest of Taka 697.93 crore from project assistance,” he said. All the approved nine projects are new schemes. The planning minister said the DFID and UNDP would provide about Tk 698 crore as grants, with the government providing the rest. The project will be implemented by the Local Government Division by February 2023. According to the project proposal, each of some 5,000 ultra-poor families will be given a two-room flat free of cost, while 15,000 ultra-poor families will be given interest-free long term housing loans under community housing development fund. The 20,000 families will be provided with basic services like water connections, sanitation, drainage and approach road facilities under the project. The flats and house building facilities will be given to residents of 11 city corporations and 25 municipalities, particularly those located along coastal areas and at high risk of being affected by climate change. The planning minister said the project was first placed before today’s meeting with the title ‘National Urban Poverty Reduction Programme’. But, Prime Minister Sheikh Hasina in the meeting changed the title of the project to ‘Improvement of Livelihood of Marginal Communities’. The prime minister also directed the authorities concerned to make separate arrangements of kitchen and toilet facilities for the project beneficiaries side by side strictly maintaining the waste management in a planned and disciplined way. The project proposal said, due to institutional weakness and financial limitations of the city corporations and municipalities in the poor slums in the cities, providing civil facilities have become a big challenge. For this, municipalities and city corporations in coastal areas where the risk of climate change is more have been brought under the project at the primary stage. Based on primary success, other municipalities will also be brought under the project.